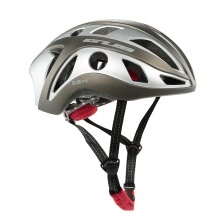 This helmet is made of expanded polystyrene, designed for pedal cyclists, skateboarding and roller skating, durable and comfortable. 22 vents with inner air channels bring cool air in and flush warm air out, well-ventilated. Rotary internal regulator at the back adjusts the tightness as you wish. Please check adjustment every time when this helmet is worn. Clean the headgear with mild soap and water ONLY.